In true coffee addict nature, I’m working on my second cup of coffee while snuggling on the sofa nestled between my hubby and son while I put this post together you guys. 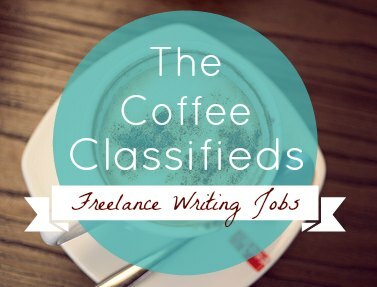 I also wanted to take this moment to let you guys know that my Coffee Classified post will be slightly belated next week, so look for the last round-up for the month on Monday instead of Sunday ;). Without further ado, here is the job post and article round-up from this past week. 4 Reasons Becoming a Full-time Freelancer Is Right for Me | Gina writes about how she’s been working towards becoming a full-time freelance. It’s a great post and one worth reading :). 3 Tips to Increasing Your Odds Of Freelancing Success | Yet another post by Gina Horkey here on the Triple F blog. She shares how, even though she has only been writing professionally for a year, she has been able to start making over $3,000 a month as a freelancer. Writing for Content Mills: Did You Pick the Wrong One? | Carol touches on the content mills and why some can make a good living of them while most can’t and should be avoided. So that about wraps up this week’s round-up post—almost. A couple weeks back, I mentioned that I would soon be looking for guest posts on the blog and last week, Freelance Freedom Fighter had its first guest post ever! Want even better news? Great! I started Freelance Freedom Fighter to both help new writer/bloggers break into freelance writing, and to create great content on the blog. Starting in December, I’ll be looking for more guest posts from both new and seasoned writers. If you’d like to know more about the writing opportunity, be sure to sign-up for the newsletter to be the first to know when the opportunity is open.